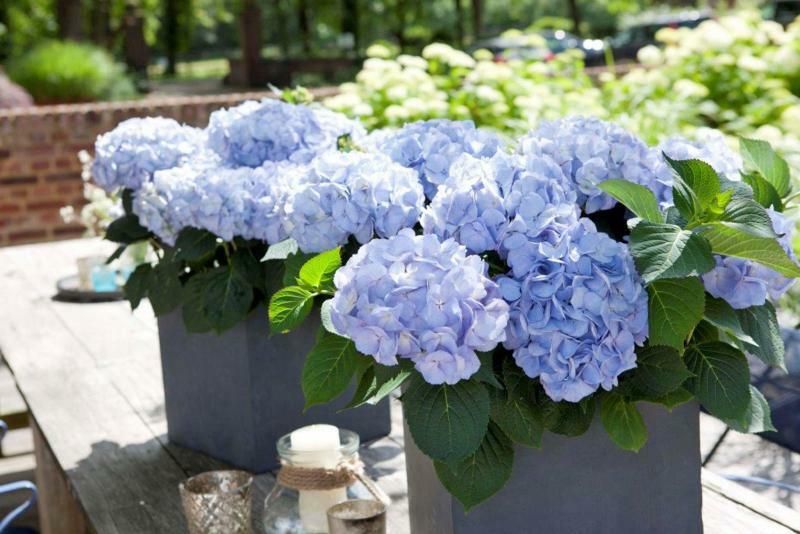 Kanmara Blue is the holy grail of potted hydrangeas. No aluminum sulfate is required to obtain these blue blooms. Unlike the Kanmara hydrangea, Endless Summer Crush is a winter hardy shrub but can also be displayed in a patio pot. Kanmara hydrangea is ideal for annual patio containers. Shown: Strong Pink. Kanmara White is elegant in groupings of identical containers. Kanmara Champagne hydrangea has blush-tinted blooms and dark green foliage. What if you could plunk a floriferous long-flowering shrub into your outdoor container — no fillers or spillers required — and it provided continuous colour from spring until fall? 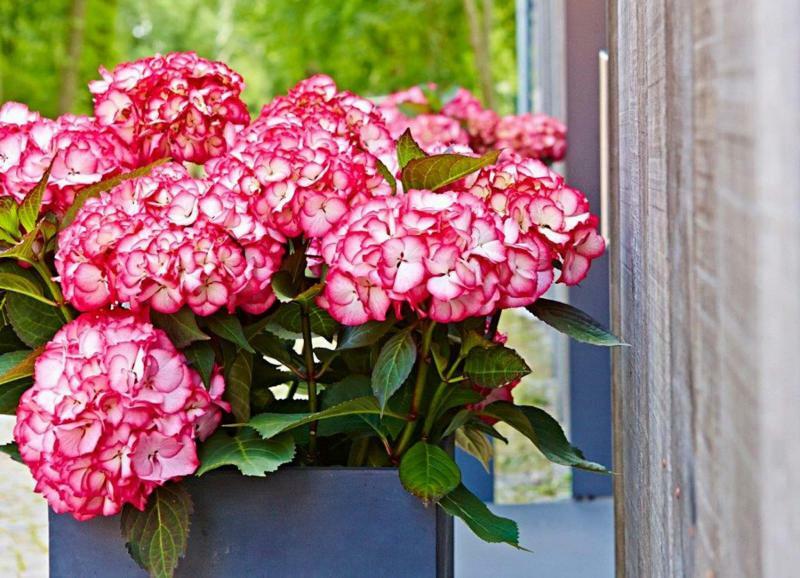 A new generation of hydrangea bred and developed specifically for patio container use, the Kanmara Hydrangea is a game-changer for container gardeners. First, it’s important to know that although this new introduction provides an excellent display for pots or in-ground plantings, Kanmara is not winter-hardy. The Kanmara hydrangea is meant to be grown as an annual and is a spectacular one at that. Joan Mazat is the head of new product development for Ball Ingenuity, which sources and promotes first-to-market and high-demand plants from independent suppliers around the world for Ball Horticultural Company, one of North America’s largest wholesale horticultural distributors. Mazat says the Kanmara hydrangea is bred by the Hydrangea Breeders Association (HBA) from the Netherlands. A leader in modern hydrangea breeding, HBA is known for its innovation, she says. HBA has partnered with Aldershot Greenhouses, a major grower in Burlington, Ont., which serves as the exclusive distributor for Kanmara in Canada. The journey to the North American marketplace for most new plant introductions typically involves rigorous testing and evaluation for their performance. Last spring, the Kanmara hydrangea series — Champagne, Pink, Strong Pink and White — was available for the first time at The Green Spot greenhouse in Brandon and sold out instantly. "They were a huge hit for us," says Bernie Whetter, owner of The Green Spot. Jen van den Ham, who, together with her mother Lillian, is a grower at The Green Spot, compares the Kanmara to an indoor florist hydrangea but says Kanmara is larger and more beautiful. "Kanmara is a showpiece," van den Ham says. Shade gardeners can rejoice, as Kanmara is ideal for full shade or semi-shade on the patio, balcony, doorstep or protected location in the landscape. A Hydrangea macrophylla with characteristically rounded flower heads, the Kanmara has a sizable yet manageable presence in the garden — the height is 51 to 61 centimetres with a spread of 61 to 81 cm. Van den Ham is impressed by the majestic size of the round blooms but says the large, dark green foliage is gorgeous, too. Kanmara has been bred to have sturdy stems. The stems, however, are strictly a supporting act. This robust and irresistible plant is covered in loads of long-blooming, vibrant flowers. Botanically, the flowers are large corymbs or inflorescences consisting of numerous, small, mostly sterile florets. Kanmara White is pure white and van den Ham says it retains its colour as it ages. The florets of Strong Pink are bi-coloured with a glowing white centre and deep pink edges. Champagne is sheer elegance with a hint of blush. Pink is definitely pink. New for this year is Kanmara Blue. Michael Dirr, a famed hydrangea breeder, says in his book, Hydrangeas for American Gardens (2004, Timber Press), "Blue in the garden is a gift from the heavens, and no species of woody shrub provides the range from the softest blue, violet-blue, to purple-blue". 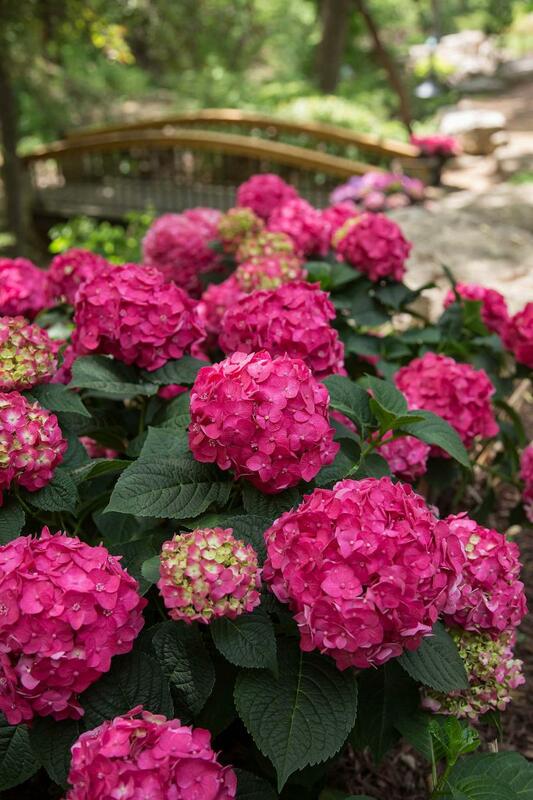 Dirr collaborated with Minnesota’s Bailey Nurseries to introduce the Endless Summer brand of hydrangea in 2004. Hardy to zone 4, Endless Summer is a macrophylla hydrangea. In our alkaline soils, Endless Summer’s mophead blooms are pink. To obtain a blue colour, the gardener must add aluminum sulfate to the soil every year. Kanmara Blue is a heavenly lilac blue. No addition of aluminum sulfate is required. The use of shrubs in the container garden has tremendous value. A shrub has longer staying power throughout the season than a flowering annual, so it represents a good investment. Fillers and trailers are not necessary, although I will sometimes add a cascading begonia and large-leaved ivy. Last year, I filled a tall urn with a single Spilled Wine weigela and placed it within my perennial bed. The bronze-purple foliage spilled out over the edges of the container and looked wonderful late into the fall. Then I lifted the shrub and planted it in my garden for the winter. I’ve also grown hardy hydrangea shrubs in containers. One year, I grew Hydrangea paniculata shrubs in pots near my front entrance. By midsummer, the flowering panicles appeared and, in the fall, I planted the hardy shrubs in the garden to overwinter. This year, I expect to try Summer Crush hydrangea in a patio container. The fifth entry in the Endless Summer series, Summer Crush is the most compact of all the varieties at 45 to 91 cm. The mophead blooms are raspberry red or neon-purple and appear in mid-summer. It’s true Kanmara is strictly for use as an annual; however, it represents an instant container display. There is no waiting for the blooms to appear. The Green Spot expects to receive its shipment of Kanmara in about four weeks time. When the shrubs arrive at local greenhouses, they will be transplanted into larger pots and cared for until they are ready for sale. Gardeners can transplant Kanmara into a container of their choice or simply insert the nursery pot into an existing container. 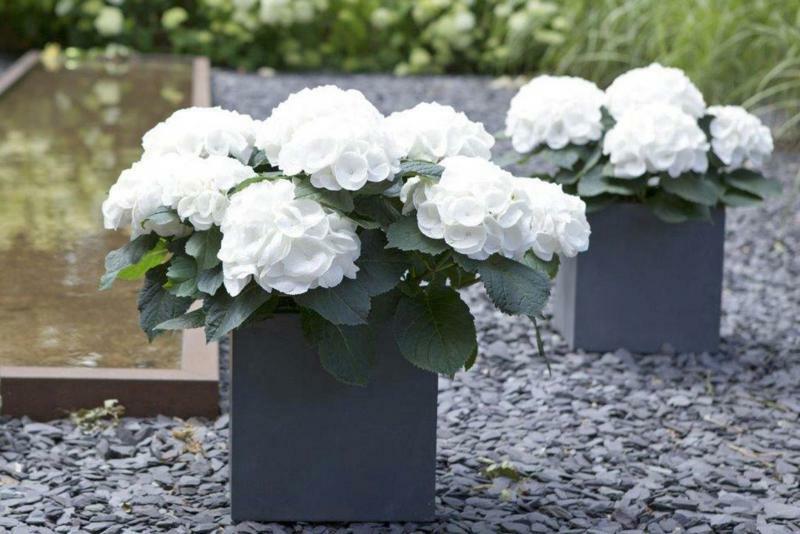 It’s essential that containers have good drainage, as the hydrangea by nature is averse to wet feet. Don’t chance it. Van den Ham says that apart from ensuring your Kanmara is located in a shady spot and that the soil is not allowed to dry out, this new shrub variety is easy to maintain and will keep blooming from late spring throughout summer and into autumn. Another bonus, van den Ham says, is it isn’t necessary to regularly prune Kanmara. If you decide to plant Kanmara directly into your garden bed, choose a protected, shady location that has well-aerated, fertile and well-drained moist soil. 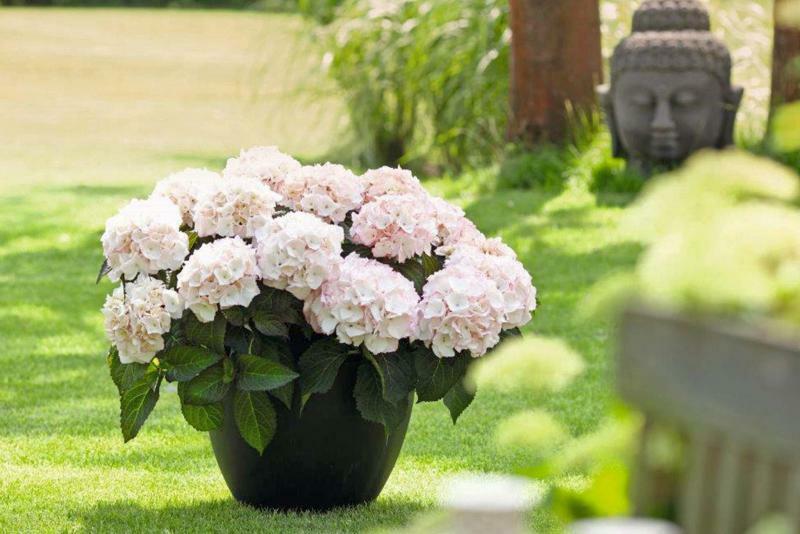 Kanmara will look stunning planted in groupings with identical containers or in containers with different heights. Van den Ham, who is getting married in October, plans to have several of the Kanmara hydrangeas at her wedding. Breeders recognize the enormous popularity of the hydrangea. There are many new compact hydrangea varieties for both indoors and outdoors on the horizon. In addition to unique shades, reliable flowering and superior branching, new hydrangea varieties are easier to grow than ever.